Born 30 March 1851 at Norwich, England. Sergt.-Major W. Alderton, a well known military instructor in Hobart for many years, passed away at his late residence, 4 Hamilton-street, yesterday. He was born at Norwich, in England, on March 30 1831, and was therefore 82 years of age. He entered the Army, and joined the 1st Battalion, 12th Regiment, at Chatham in March, 1851, and after serving in England and Ireland embarked from Cork on July 1, 1854, with the regiment in the ship Camperdown, and landed at Melbourne on October l8 of the same year. On the 20th he started on the march with his company (under Captain Quade) for Ballarat, where he was present, at the capture of the Eureka Stockade. 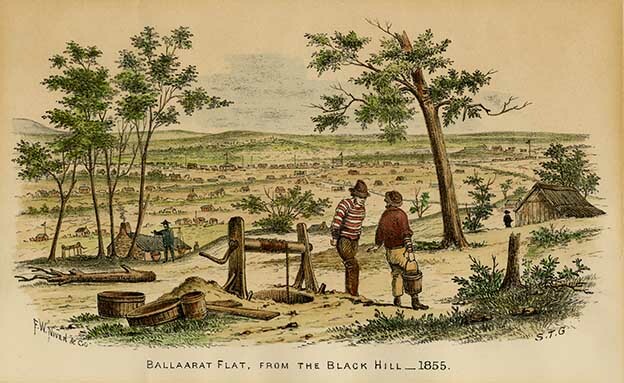 He remained at Ballarat until August, 1855, when the company rejoined the head- quarters of the regiment at Melbourne, bivoualking at Ballan and Bacchus Marsh en route. He sailed from Melbourne on December 25, 1855, and after serving in West Australia and New South Wales arrived at Launceston with a detachment of the regiment on July 28, 1859. He left for Hobart in May, 1860, marching into Hobart Town on the 25th. He had resided in Tasmania ever since that date. In 1863, having completed his first term of military service, he was, on the recommendation of Lieut. Col. Kempt, appointed by the Governor in Council to the position of Sergt. Major of the Tasmanian Volunteers. Sergt.-Major Alderton had the quick eye, strong voice, and energy of the successful non-commissioned officer. He was married twice, and leaves several descendants. SGT.-MAJOR ALDERTON'S REMINISCENCE. THE EUREKA STOCKADE. "Im a wee bit deaf, I'm a wee bit deaf," observed Sergeant-Major Alderton to a "Mercury" representative, "but," he added, with an alacrity that would have done justice to a far younger man, "that's all there is wrong with me." Nothing looked wrong with him. Ruddy of check, quick of speech, active of intellect, with a frame that carried itself remarkably well-a fine tribute to the healthy life he had led-the venerable soldier told the story of his long military career, with an interest in the telling that suggested only the soldier's pride in the possession of an escutcheon which still shines untarnished, though it is no longer carried on high. There is an end lo all things. Soldiers come and soldiers go, but the glamour of the military career will always remain, so long as it is possible for men to fight their battles over and over again in the calm of an evening's repose, Sergeant-Major Alderton celebrated his 80th birthday a few days ago, and it was this event which led the pressman to seek him out. "I was born on the 30th March, 1831, at Norwich, in England," the sergeant began, telling his own story, 'and I can remember when Norwich had 36 churches, two gaols, ono gallows, and a fine cathedral. They say that the man who built the gallows was the first man to be hanged on it-but you'd better not put that in the paper." The semi-aside was ignored, and the sergeant went on to explain how, at 20, he enlisted in the East Suffolks at Bury St. Edmunds, and, after spending a short period in Ireland, sailed by the good ship Camperdown from England on July. 1, 1854. Since that day he has not seen his homeland. There were stirring times in front of the young sergeant for he had at that time gained promotion, and he arrived at Melbourne, after a voyage lasting 110 days, in time to take part in the historic battle of the Eureka Stockade. He landed on October l8, 1854, and on the 20th began the forced march to the scene of the trouble, bivouacking nightly on the journey. "Tell me about the Stockade?" the interviewer asked, and, occasionally allowing his thoughts to flow faster than his word, the sergeant-major explained that his company had gone up to reinforce the troops already at Ballarat. "I remember the night before the at- tack. We were on one of the hills near Ballarat, when a drummer boy and a man named Wright were brought into camp, one with a gunshot wound, and one wounded by a missile which had been thrown at his head. That night the troops turned out, and we remained under arms until after the Stockade attack, about eight or ten days. Some people say that, we went under arms only two days before, but 1 think it was longer than that. "Anyhow," he went on, "Captain Thomas was in charge, and after a day or two he made up his mind to get things settled. At midnight on the 2nd December we turned out-two companies of foot, a company of the 40th Regiment, and the mounted police, who were known as the 'gentleman cadets.' We marched in the gully between Soldiers'Hill and the Government camp towards the stockade, and 1 remember, as though he were speaking now, the address which Captain Thomas delivered to us in that gully. "Soldiers of the 12th, and 40th,' he said, 'you are going on a very important duty. You are not going against a foreign foe; you are going against men who are taking illegal steps to remedy the grievances they say they have. Probably many of you know these men, probably they were schoolfellows, or probably they are relatives. But, if it comes to blows-I hope it may not-you will have to do your, duty. Don't commit an action for which your conscience will prick you. If you see a man fire direct at you, and he throws down his arms, spare that man.'" The sergeant paused to take breath. "We marched up the gully in fours," he resumed in a few seconds, "and the only shot that was fired was from the top of Black Hill, probably a signal to the, rioters. As we got nearer to the stockade we opened out, approaching in extended formation, and just as we were doing this we were met with a very severe muskets, pistols, all sorts of small arms;' from the stockade, which consisted of a series of slabs built like a dogwood fence, with a trench round it a foot or l8 inches wide. What the trench was tor I never could make out. "We went on, and when the men behind the stockade saw the soldiers coming with fixed bayonets they dispersed like rabbits." "No, it was all over in about ten minutes, though I firmly believe that if those men had understood firing discipline we should never have got inside. But as soon as we approached the stockade the men look refuge in tents, and were blazing away at us through the tents. When we got there they had no reserve fire, and we simply went in. Our mounted men rode round the stockade, taking from 130 to 150 prisoners, though I believe a lot of these were men who had just come down to look on." Though it did not last long, the approach to the stockade was a lively one, and four men were killed and l4 wounded in the space of that ten minutes. Included in the four were Captain Wise, who fell quite close to the sergeant. "When he fell the men began to pay more attention to him than to the march, but he shouted out. 'Go on, lads, don't wait for me; never mind me, go on.' That happened twenty yards from the stockade, and a man named Rooney was shot dead before we fired a shot." Inside the stockade what happened ? "Oh, notbing. I went inside, and, 'pon my soul, I only saw three or four men. The rest had gone, and from that moment everything was over. Reinforcements came up, and were barracked at Ballarat, but before many days had elapsed the men who had kicked up the row and the soldiers were the best of friends. I remained in the district for ten months, and during the greater part of the time our relations were of the most friendly description." The sergeant-major's subsequent career was not very exciting. He has seen duty in West Australia, in New South Wales, and in Tasmania, but, as he put it, it was his luck to be out when the good things were going. Later years have been spent in the work of organisation and instruction in Tasmania, though the sergeant-major refers with some pride to the fact that he celebrated his 70th birthday in camp at New Town. ↑ Hobart Mercury,23 June 1913. ↑ Brisbane Truth, 06 July 2016. ↑ Hobart Mercury, 8 April 1911. This page was last edited on 6 August 2017, at 12:17.